Celebrating the 200th Anniversary of the publication of Frankenstein! Mel Brooks gut-busting take on the legend of Frankenstein should need no introduction. 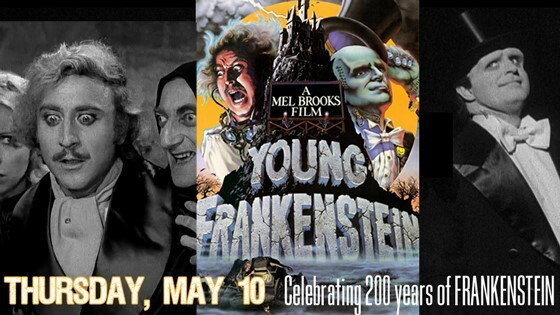 But if you insist, Dr. Frankenstein's grandson, Frederick (Wilder) reluctantly returns to the family home and resumes the experiments his grandfather began. Before you can say "It's Alive!!" Monsters are dancing, humps are moving and the towns people are pitchforked and ready to rumble. In glorious black and white on the big screen, don't miss your chance. And give Mary Shelley her due - read the book.